Almost thirty years ago I saw in a garden magazine the picture of a Brugmansia flower. I was so fascinated that I bought one plant. It was the beginning of a passion for these impressive plants which has been lasting until today. In 1984 I started actively with the hybridizing of Brugmansia and have tried to implement my hybridizer dreams into reality. In the beginning it was everything else but easy. I started to search with persistence and patience in botanical gardens and nurseries in Germany and Europe for additional species and hybrids, which were useful for my project. Not all of them proved to be suitable and for that reason only very few of these old Cultivars are present in the family tree of my Brugmansia – Cultivars. 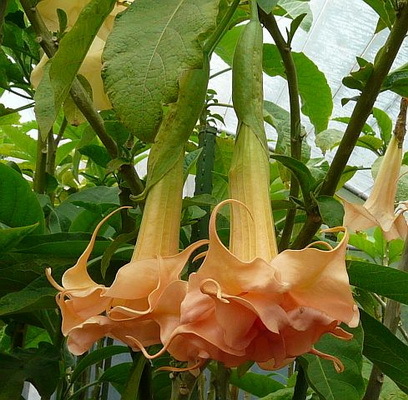 The Brugmansia – Cultivars on this list are the result of planned hybridizing concept and rigorous selection out of thousands of seedlings grown over many years.